Please note prescription requests by telephone are not permitted at either Penryn Surgery, Mawnan Smith Surgery or Stithians Surgery. Please plan ahead when ordering your medication to avoid running out. Keep the white counterfoil from the previous prescription, tick the medication you require and drop the slip into the blue box at your surgery. Online with SystmOnline available through our website penrynsurgery.co.uk or there are mobile apps available from the Apple App store or Android Play Store. You will need to register in person at the surgery to use on-line services. Please bring current photo ID and a personal email address to any of our receptionists to receive your secure log-in. Forgotten to order your medication? Due to an increasing number of requests for repeat prescriptions to be ordered urgently, priority will only be given to medication which you need within 24 hours to prevent you becoming severely unwell. Emergency medication includes : diabetic medications, inhalers, angina sprays, anaphylaxis pens and epilepsy medication. Emergency prescription requests are not requests for medication which has been ordered late. We will not issue urgent prescriptions for items that can be bought over the counter. If the doctor feels your medication cannot be missed, the item will be issued and will be available for collection from 5.30pm at Penryn Surgery. When ordering your prescriptions online please be aware that: Your medication will be ready for collection at the pharmacy, dispensary or delivery point you have arranged with the practice in advance. If you wish to change this please contact the Prescription Desk in person or by phone on 01326 371421. If you are unable to put a tick next to any particular medication and it states, "Needs reviewing by a GP or nurse', then please scroll to the bottom of the order page and make a custom request. Type the name and strength in the empty text box and submit your order. The doctor will then assess your request. You may not need a face to face review so PLEASE DO NOT book an appointment unless you are asked to have one with our clinical pharmacist. ie live more than 1 mile (1.6km) from a chemist. (Most addresses in the Falmouth and Penryn town areas are not dispensing). 2. You have completed a delivery service application form and returned it to Penryn Surgery. You can download one here or collect one from Penryn Surgery dispensary. It must be printed, signed and returned to the dispensary at Penryn Surgery before your prescription can be delivered. If you live more than a mile from the nearest chemist you can apply to collect your medication from one of our delivery points; Mabe Post Office, Perranarworthal Post Office, Ponsanooth Post Office, Rame Post Office or Mylor Stores. 3 working days to collect your medication from our pharmacy, dispensary or home delivery. Making sure you have not run completely out of your medication before ordering more. If ordering on a Friday make sure you have enough to last until Wednesday. Making sure you clearly identify the name and strength of the medication you require. Ideally keep hold of the counterfoil from your last prescription and indicate on this which you require. Enclosing a Stamped Addressed Envelope when posting if you require us to send it back to you. If you are requiring medication early or more than one month to cover a trip away, please ensure you note the reason on any request. Otherwise your medication will be ordered routinely on the normal due date. If you get regular prescriptions, the Electronic Prescription Service (EPS) may be able to save you time by avoiding unnecessary trips to your GP. EPS makes it possible for your prescriptions to be sent electronically to the pharmacy of your choice. Choosing a pharmacy contractor to process your EPS prescription is called nomination. This means you'll no longer have to collect a paper repeat prescription from your GP practice – instead, you can go straight to the nominated pharmacy contractor to pick up your medicines or medical appliances. Because your pharmacist has already received your electronic prescription, they may be able to prepare your items in advance, so you just have to pick it up with no extra wait. However, this depends on the capacity of pharmacists on the day, and may not be possible all the time. You may be able to order or cancel your repeat prescriptions online if your GP practice offers a GP online service. Check with your GP practice to find out how you can register for an account. For more detailed information, download the EPS patient information leaflet (PDF, 52.8kb). Or watch What is EPS? on the EPS YouTube channel. In the future, EPS will become the default option for the prescribing, dispensing and reimbursement of prescriptions in primary care in England. More information about this will be available soon. How can I start using EPS? You don't need a computer to use EPS – you can use it as long as both your GP surgery and the pharmacy offers the service. Use the Services near you search to check whether a pharmacy or GP currently provides this service. Simply select "Pharmacies" or "GPs" from the dropdown menu at the top of this page, then enter a postcode and select the provider of your choice. If EPS is available, you'll see the EPS logo on the provider's profile page, alongside contact details and opening times. 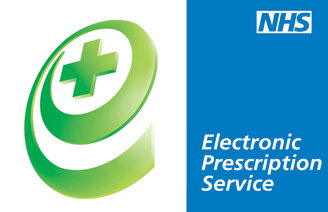 GP practices and pharmacies may also display the EPS sign on their premises to show that they offer this service. Ask your pharmacist or GP for more advice – they'll be happy to help you. You'll then need to nominate the place you'd like to pick up your prescription medicines or appliances from in the future. You can choose the most convenient place for you, such as near your home, where you shop, or where you work. This is flexible and can be changed at any time – just let your doctor or pharmacy know. How can I cancel the service? You can always change or cancel your nomination. Simply speak to your GP or pharmacist before you order your next prescription. Allow time for the update to take place to avoid your next prescription being sent to the wrong place. Who can see my prescription? EPS is reliable, secure and confidential. Your electronic prescription will be seen by the same people in GP practices, pharmacies, and NHS prescription payment and fraud agencies that see your paper prescription now. They'll also be able to see whether you've nominated more than one dispenser and can check where your prescriptions will be sent to. If you're on repeat prescriptions, dispensers will also see all of the items on your reorder slip. What can I do if I'm unhappy with the nomination process? All patients must be provided with sufficient information about EPS and give their consent before a nomination is recorded. If you're unhappy with your experience of nomination, you can complain to the pharmacy, dispensing appliance contractor, or GP practice. Alternatively, you can also complain to your local clinical commissioning group (CCG).